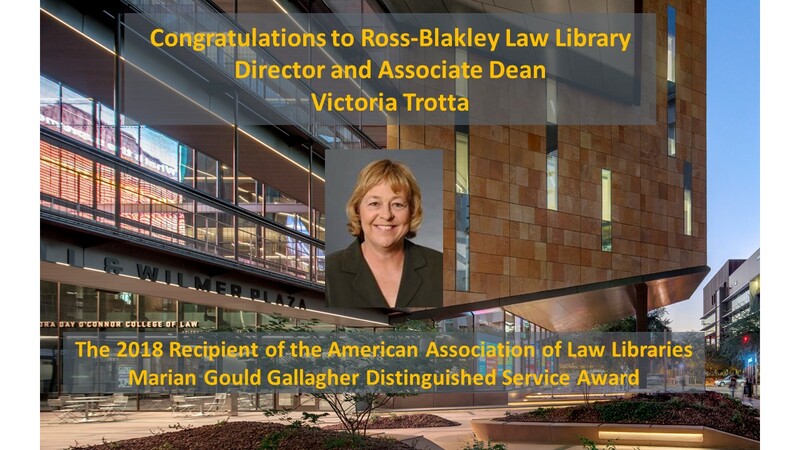 Dean Victoria Trotta is the 2018 recipient of the American Association of Law Libraries Marian Gould Gallagher Distinguished Service Award. The Distinguished Service Award was established in 1984 to recognize exemplary service to the Association. The Award is given in recognition of a career of outstanding, extended, and sustained service to law librarianship and to AALL. This award is the Association’s highest honor. We are so happy for Tory and her well-deserved accolade. This entry was posted in Legal News, Misc. on April 24, 2018 by Leslie Pardo. The Ross-Blakley Law Library at the Sandra Day O’Connor College of Law is pleased to announce the 2018 recipients of The Ross-Blakley Law Library Award for Exemplary Student Research. Steven Perlmutter is the first place award recipient for his paper High Times Ahead: Products Liability in Medical Marijuana. Perlmutter received his JD degree from ASU Law and is now pursing an LLM degree. Celeste Robertson takes second-place honors for her paper When Bitcoins Buy Opioids: Why Amending the Federal Money Laundering Statutes is Necessary to Combat the Opioid Crisis. Robertson is a 2L. Their papers demonstrate sophistication and originality in the use of research materials, exceptional innovation in research strategy, and skillful synthesis of research results into a comprehensive scholarly analysis. This entry was posted in Uncategorized on April 18, 2018 by Leslie Pardo.